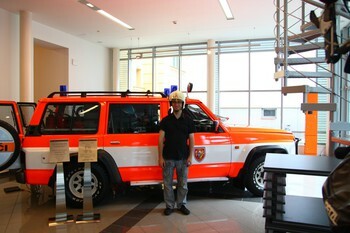 During the last week we went to visit the fire fighting museum and also the city part Ostrava-Vitkovice. On the other day we went to see the chateau Fryštát in Karviná city centre. You can see the pictures after clicking on the links below. My friends planned to go to the top of Lysá hora mountain. Since I have not been there for several months, I agreed to join them. The weather was extremely hot and the parts of the journey on the direct Sun were very difficult, but in the end we made it. 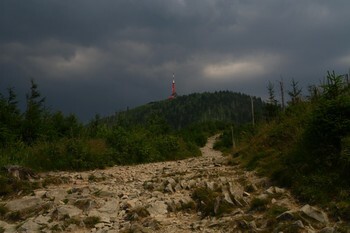 On the top we refreshed ourselves, had lunch and headed quickly back, because the storm was coming. And just as we sat down into the car, it started to rain. We were quite lucky. Two weeks ago I attended a trip to Hustopeče with RAYNET. We had an accommodation in a very nice guest house „U Radů“. On Friday evening, we stayed there in the garden, grilled large piece of meat and consumed formidable amount of wine, gin and vodka and had a lot of fun. Since we had booked a paintball session, we had to get up quite early (about 8 o'clock). For some of the people (and their stomachs) that was a truly heroic achievement . The paintball battle itself was an unique experience for me, especially running in the uniform and mask for five hours in the thirty degrees heat was very tiring. We played several scenarios: team deathmatch, two kinds of capture the flag and a fortress siege. All of them required a big deal of tactics and communication skills. I got hit several times and the „bullets“ left marks on my body for several following days. After coming back from the battle we went to the wine cellar to have good local wine. At first, we tasted almost all kinds of wine they had there, then everybody could drink as much as possible. On Sunday we woke up and went home. It was a very good weekend, I enjoyed it properly and certainly hope that it was not the last one.